Home Community Development Educational ARRIVE ALIVE - THE OKADA RIDER, THE PASSENGER AND HOW MANY DIE DAILY IN KUBWA AND BEYOND. 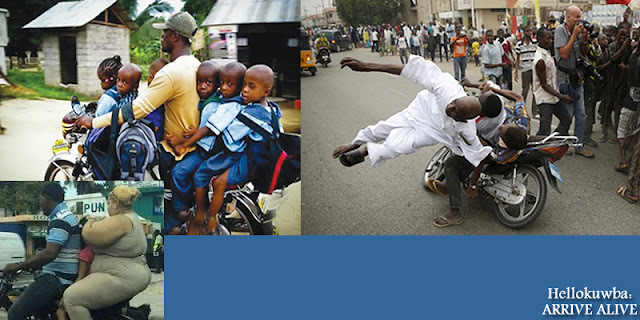 ARRIVE ALIVE - THE OKADA RIDER, THE PASSENGER AND HOW MANY DIE DAILY IN KUBWA AND BEYOND. The most common transport vehicle in most part of kubwa is Okada or bike or Achaba or going, any name you call it, you know what it is. They help you get to places taxis don't usually get to or are not even running yet. Though they hardly move when it is raining, they can be available from as early as 6am to as late as 12 midnight. Beyond a mean of livelihood, they have been a major ease to getting around very easily. They also teach you the names of places you've never been as a JJC or as an old school. However, some of the riders have been a menace to the society. Not only do they throw caution in the wind, they endanger the lives of passengers, other bikes, pedestrians and even cars sometimes. On several visits to the Kubwa general hospital, you will discover that at least 1-5 casualties of Okada related accidents are brought in every 2 hours. 25% of the times, a life has been lost or more. These are preventable if just a little caution was taken. We have listed these simple tips to having a safe ride with bikes when you have to ride or be ridden. 1. Tell the Okada rider to "take it easy" Before you even climb the bike or start the movement and keep your watch as you guys progress. You don't need to be overly fearful, but be on the watch. 2. When you approach Tee or cross junctions, always tell them to slow down and watch properly before blowing across. 3. If you perceive he has some alcohol in his breath or talking incoherently, please let him go oh...a drunken man can't even walk straight, nor ride straight talk more of thinking straight. 4. If you can't communicate in the language he is speaking, you can seek help from a passer-by or another rider to explain to him where you are going or how much you are willing to pay so that there will be a consensus on the price and not "bad belle vexing and riding". Else, just get another bike that you can understand and that can understand you. 5. As often as possible watch properly in areas where there are lots of children playing or running, where there are gates that open into a street, from parking areas of churches, restaurants, fast food, joints, bending corners etc so you don't get run into from a blind spot. 6. If you see that the bike rider has gotten into a speed competition with another bike or even car on the road, please gently tap him to slow down, or even say you want to drop so he can stop. You can abort the trip with him if he won't listen. Hope this was of value to you. Pease share this post with as many people as possible, you could be saving a rider or a loved one.